Why should you attend your district's annual meeting? Each summer, all 51 SEANC districts hold annual meetings open to all members of that district. This is your chance to directly affect the association’s priorities and guiding principles for the coming year by bringing ideas and concerns to your district’s annual meeting before they are decided upon at convention. Click here to find information on your district's 2017 meeting. You are the best source for identifying opportunities to improve your workplace practices. Policy platform objectives and bylaws amendments are voted on at district-level annual meetings before being considered by a statewide committee, who then may pass them on to the convention for a vote. Policy platform objectives - The policy platform objectives outline the procedures and goals that guide the association’s lobbying activities. They offer a way for us to bring our collective recommendations to the attention of those with the authority to enact change — namely, the governor and the General Assembly. 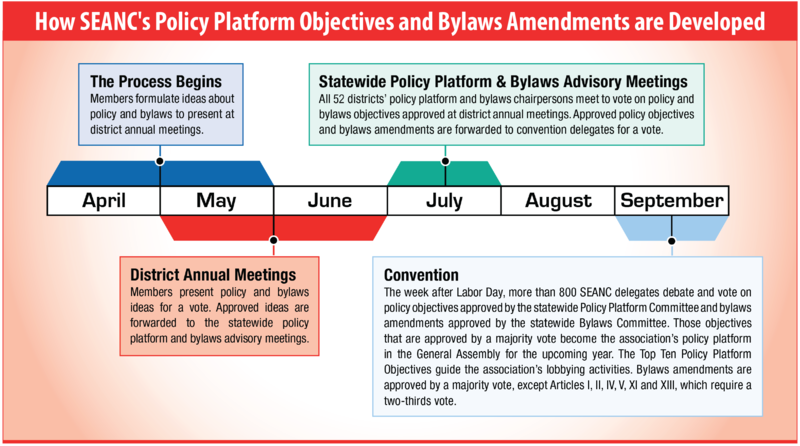 Bylaws amendments - Bylaws keep SEANC moving forward. They define the purpose and internal structure of our organization. When you vote at your annual meeting, you are making a difference on the ground floor. Changes in bylaws begin at district level and must be approved by at least one district before they are brought to the state bylaws committee. If approved, they are presented at the annual convention to be voted on by all delegates. Experts available to assist you - Chairpersons and policy platform and bylaws committee members are available at the meeting to assist you in developing your ideas into formal amendments or objectives and in drafting revisions to existing policy. Delegates to the convention and district officers are chosen at annual meetings. In addition, candidates for SEANC's statewide officers will lay out their own visions for the coming year and ask for your support. Representatives from the SEANC staff will provide an update on the legislative session, State Health Plan, retirement system, membership news and more. Also, the district annual meeting gives you the opportunity to gain new ideas on ways to protect, enhance and advocate for your rights and benefits.